For long days in mixed weather, the redesigned Guide™ Jacket is built-to-fish with Gore-Tex® Shell fabric that’s waterproof, breathable, lightweight, and tenacious against tears. Guide-tested features include two top-loading, fly-box compatible storage pockets with integrated retractors that keep loose ends locked in. Shingle Cuff™ engineering eliminates line catch points for unimpeded casting. And a Tuck-Away fly patch folds out to hold sidelined bugs, or can be combined with an attachable Simms’ Fractal foam fly patch (sold separately). GORE-TEX® PRO SHELL outerwear is waterproof, exceptionally lightweight and offers the ultimate in breathability, durability and extended comfort. Constructed with a woven backer, GORE-TEX® Pro Shell garments slide easily over other layers and offer exceptional tear strength and internal abrasion-resistance. Little Parts from the YKK® Fastening Products Group create The Big Difference for our customers — fastening solutions intelligently integrated with the finished product to provide the highest quality, most durable gear. The Little Parts — zippers, metal buttons and snaps, and Nylon buckles — all earn the YKK® brand. The Big Difference begins with their obsession to ensure that every individual component renders maximum value to the finished whole. That commitment instills quality and value into every product. Simms utilizes fasteners built to withstand the harshest environments and YKK® provides the best solutions to meet those needs. 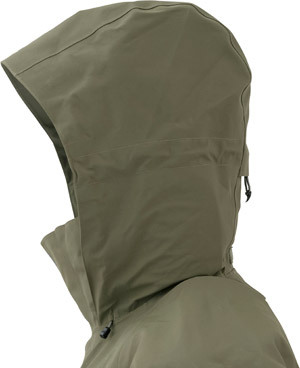 All Simms outerwear features nylon YKK® zippers to minimize corrosion and provide high performing, durable wear.